Objective: Global professional services firm, Arup, moved from Cisco Cloud Web Security (CWS) to Cisco Umbrella. By implementing a secure internet gateway in conjunction with nextgen endpoint security, Arup secured access to the internet wherever users go, reduced its exposure to malware and improved the ability to detect, respond and remediate when necessary. 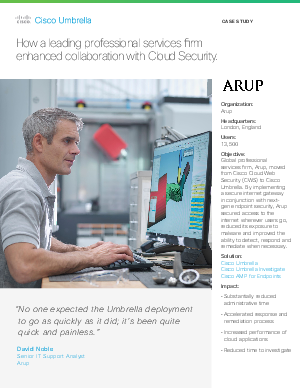 Download this case study to learn more about how Arup benefited from Cisco Umbrella products.